Graduate bulletins constitute the legally binding contract with incoming undergraduate students. Each issue was published for a college term, often from September of one year until June of the next. Each bulletin provides extensive details about coursework, admissions, academic requirements and financial obligations, as well as a list of faculty, adjunct faculty, administrators and other relevant contact information. Herein you will find bulletins for the Graduate School of Business, Graduate School of Education, Graduate School of Library and Information Science, Graduate School of Social Work, and Villa Schifanoia. Early Business School bulletins were simply called MBA Bulletin. Beginning in 1983, bulletins for the Business School, Library and Information Science School and the Special Education School were contained in a single publication. After 1989, however, the Business School returned to having its own edition which was called the Bulletin of Rosary College Graduate School of Business. In 1997, when the name if the institution changed to Dominican University, the name of the Business Bulletin changed to reflect the name change, as well as expanded their size and format. The 2004 — 2006 edition is not a bound volume, rather it is a promotional packet in a printed folder. In 2006, the school changed its name to the Brennan School of Business, and likewise changed the format of their bulletin again. Beginning in 1977, the MS/LD Program was part of the Psychology Department in conjunction with the undergraduate Learning Disabilities Program. Special education had its origins at Rosary College in the Psychology Department, and Daniel Beach was its first director, hired in 1975. Thus, the first graduate program in education had its home in the Psychology Department. The MS/LD was approved by the state in 1979. Eventually, it served as the basis for the School of Special Education when it was spun-off, and Sister Marie Grant became its dean. Later, the Education Department and the Day-Care Center were folded into the school, which was renamed the School of Education in 1989. Respective titles of the school for each edition is noted in parentheses after the years of coverage. 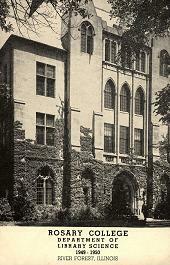 While the Library Science program began in 1930, it was in 1949 that the College inaugurated a Masters degree program. Bachelor Library Science programs were discontinued in 1952. Early bulletins were for the Department of Library Science; beginning in 1970 the department was known as the Graduate School of Library Science. Starting in 1982 the school adopted its current name, Graduate School of Library and Information Science (GSLIS). This journal was published semi-annually by the Graduate School of Library and Information Science of Rosary College. 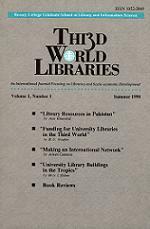 Originally titled Thi3d World Libraries this Graduate School of Library and Information Science journal is today called World Libraries. Issues are bi-annual, but the date listed on each issue does not always correspond to actual date of issuance. Publication began in the summer of 1990 and continues to today, though the editors plan to cease issuing print editions. During the year 2008 World Libraries will exist as an electronic journal; the journal also plans to make every article accessible online. Please visit the World Libraries website for more information. This section lists graduate publications which are represented by single issues, or special editions that were not regularly published.